I've finally made my card for Dezinaworlds Everyone Wins Challenge. June is very kindly giving everyone who enters this challenge a prize. You have to use one of June's images but she has loads of freebies in various styles. I used this image for a wedding card. My OH's cousin is getting married and I thought this would be perfect for them. It used to have French writing at the bottom which said, Bonne Fete, which I think means Happy Birthday so I cut that off. 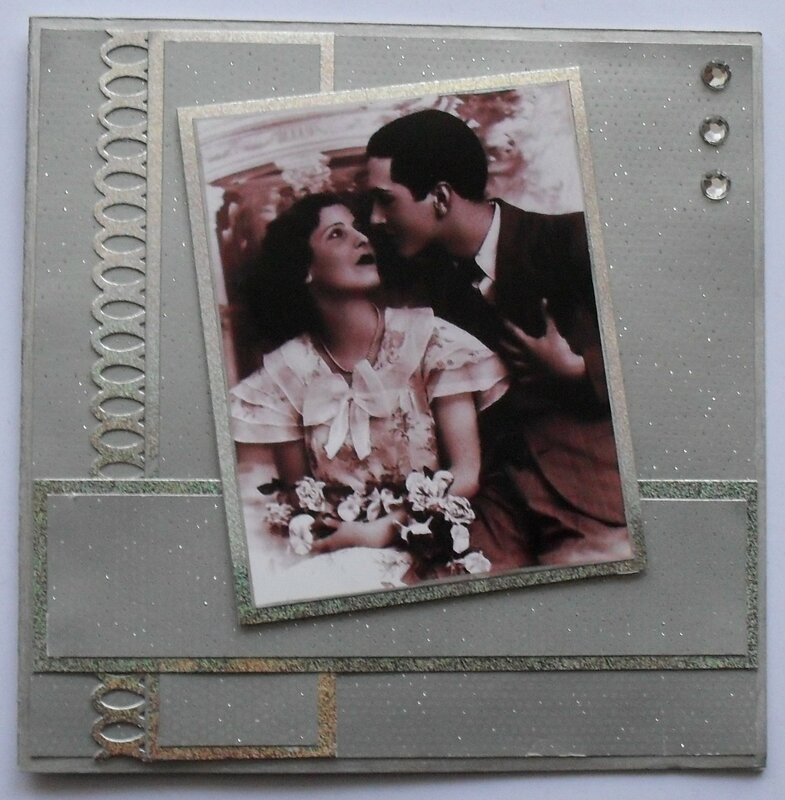 I have used various silver papers, which I got from 'Home Bargains' for 89p. There is a holographic one which I used at matting and a mat silver with little glittery spots for the main mats. I coloured the edge of the card with my silver Sakura pen. I'm really pleased with how it turned out and I hope you like it too. I will be adding a Wedding sentiment when I find one. I've never made a wedding card for someone before. Hello Poppet. This is beautiful and I love all the different papers and your border is really pretty to add that classy finish. Just beautiful. Happy crafting. This is a lovely lovely card! Very very elegant and blingy!!!!! Thank you for playing along with us at OSAAT! Beautiful card. Simply elegant. Thanks for sharing and have a great day. Angela. Super card love the vintage look!! THAT is a very beautyful card!! !